Spectrum Next KickStarter - Smashed! So, as most of you know, the Kick Starter campaign for the ZX Spectrum Next kicked off at one minute into the 23rd day of April, 2017, officially recognised as the ZX Spectrum's 35th Birthday. Within hours it was at a staggering 10% of it's goal. Amazingly, within less than two days it was complete. The future is set; the future is Spectrum. What incredible comradery was shown by all who could manage to stump up the minimal £99 and those who couldn't showed support in so many other ways on the Facebook groups and elsewhere. The community was literally buzzing with eager-beavers scurrying around to get the word out. At the fall of the 24th hour, the target was at an impressive 93%. Forward a few hours and only 40 shy of 1,200 backers were able to reach the staggering £250,000 target in record time of about (coincidentally) 35 hours. It's as if it was just meant to be! It is hoped that this breath of fresh air in to the Speccy community will muster a wave of new talent in the form of developers. Many example games have been edited & upgraded to take advantage of the new hardware already, but of course, this new machine affords the youth of today (and the old fogies of yesteryear) an opportunity to learn from a system that just gives & gives. What is a great shame is the apparent lack of Sam Coupe compatibility. There are rumours galore, but I've not heard anything solid from those in the know (or, I simply missed it). Likewise, there doesn't seem to be any QL compatibility either, again, something longed for by a small but equally worthy group of individuals. Well done to all involved. I'm glad to have been a small cog of the bigger machine. The kickstarter campaign has exceeded the £500,000 goal with more than a full week remaining, so there's still time to help reach other 'stretch goals'. At time of writing, the KS campaign is at a healthy £501,943 and rising (it's already jumped up since editing this page). Other updates to this project include a variety of unlocked stretch goals. 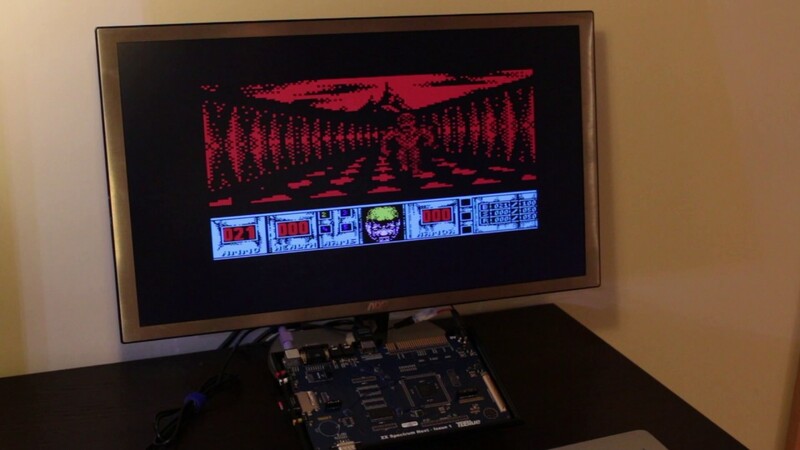 The Oliver Twins have promised a new Dizzy game for the Next, easier memory expansion met and a larger FPGA meaning more 'Ooomph' for your buck! Over recent days & weeks there have been a few updates worthy of mention. A shop section has been added to the main Spectrum Next website and Devkits have been rolled out in the form of issue 0 & issue 1 boards. Ever since the end of the KS, we’ve been inundated with queries and requests to make the Spectrum Next available for purchase by those who, for one reason or another, couldn’t join the crowdfunding campaign. We thought hard and carefully about this, how to manage it, roll out, and how to make it fair for the backers who joined us early on. Our solution is now live: the Next is available for pre-ordering here on the website. There are, though, a couple of changes we made to keep things fair for everyone: first, the shipping date is a month later than for the KS backers, they will get their boards and machines first; second, the Next now has a 20% margin over the original price, which was at cost for the crowdfunding campaign only. We believe this strikes a fair and good balance for backers and new users alike, and enables everyone who’s a Speccy fan to get their hands on the Spectrum Next. So, if you were one of those who have been waiting for a solution in order to get a Next, head over to the Shop right here. If you are one of the backers already, make sure to welcome the new members of the community who will help us all make the Spectrum Next an even bigger success! The shop currently has available a board only purchase option, which as the name suggests enables a buyer to select only the board on it's own. This means you would need to have an actual hardware spectrum at home to fit the board into it. You will also need a means to power & communicate (keyboard, etc.) with it. The board only option comes in at a not-too-shabby £142.80 inc. VAT. Alternatively, you can buy the default machine ready to rumble at a slightly higher £252 inc. VAT. This has all the necessary gubbins to have it working out of the box as soon as you've opened it. This comes also with a printed manual, much to the delight of many. Finally, you may prefer to have the accelerated variant which comes in at a hefty £330 inc. VAT. Now, that is admitedly a steep cost for an 8 bit machine. BUT, keep in mind it affords it's owner a lot more than the standard forms including a Real Time Clock, WiFi and an accelerator board. ALL Kickstarter Stretch Goals Unlocked!